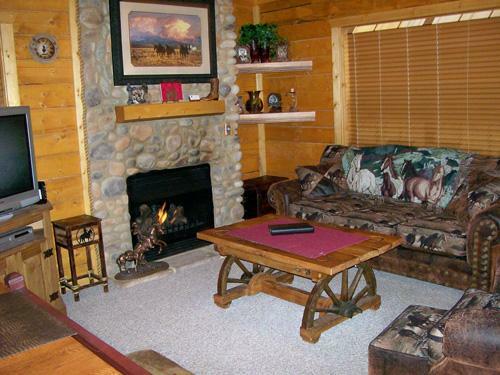 Offering comfortable and convenient cabins in the heart of Branson, Cabins at Grand Mountain by Thousand Hills Golf Resort offers soothing accommodations and elegant features. Guests can enjoy free Wi-Fi, in-room stone fireplaces, an indoor and an outdoor pool, a sauna, fitness facilities, outdoor barbecue grills, an on-site tennis court, a guest laundry facility, a gift shop and more. Conveniently located in the heart of Branson, yet tucked into the trees. Access to pools, golf course, tennis courts and fitness center. Minutes away from many restaurants such as the new Pasgetti's and theatres such as Starlite and Clay Cooper. Easy access to Tanger Mall. Tucked into the heart of Branson yet surrounded by nature, the Cabins at Grand Mountain offer both luxury and convenience. Enjoy the best of both worlds! Elegant appointments such as tiled countertops, wood flooring, stone fireplaces, and Jacuzzi tubs will pamper you. When you can relax no more - entertainment, shopping, golf, and restaurants are right outside waiting for you. 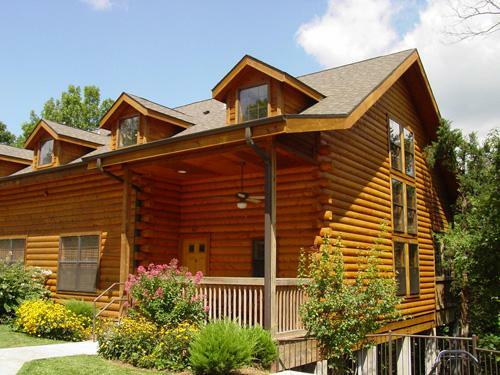 In this quiet wooded area of central Branson, our luxurious log cabins are available in a variety of sizes. We feature the romantic intimate setting of the smallest cabin, to the larger two bedroom cabins with sleeping for up to eight. Most feature a fully equipped kitchen, living room, dining room and private porch. How many cabins are available at Cabins at Grand Mountain? There are 92 cabins available at this property. Do you have a minimum age required for check-in?Guests must be at least 21 years of age to check-in at this property. 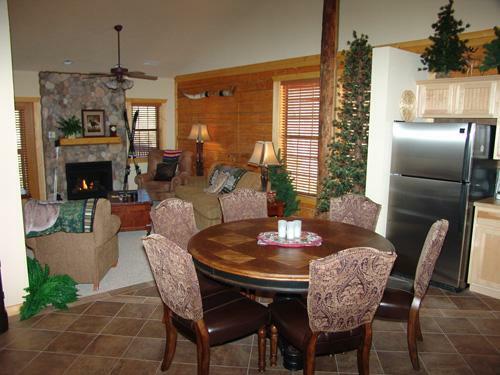 There is no resort fee at the Cabins at Grand Mountain. Do you charge for cribs or rollaways at the Cabins at Grand Mountain?Pack N Plays are available at no charge. Rollaways are not available. What are the pool hours at the Cabins at Grand Mountain?The pool is open from 8am - 11pm. What is the check-in procedure for the cabins? Guests will need to check in at the Thousand Hills Golf Resort, located at 245 S. Wildwood Drive in Branson. Are all of the cabins at Cabins at Grand Mountain decorated differently? Yes, they are decorated differently as each is individually owned. However, each must meet strict standards in order to be managed by our management company; many use the services of decorators to ready their units for rental. No, but guests do have privileges at Thousand Hills Resort's golf shop. Is there Wi-Fi throughout the property? Are pets allowed at Cabins at Grand Mountain? What is the resort's check-in policy? You must have a Photo ID and E-Ticket upon check-in with a valid credit card. Your card will be swiped but no funds will be charged and no pre-authorizations will be attached to your credit card unless there is damage done to the room.